With the right setup, email marketing is one of the most measurable marketing mediums on the planet. For every campaign, you can track how many people opened it, how many clicked, exactly where in the email they clicked, what they did on your website, and how much revenue each campaign generated for you. But with so much information at your fingertips, it can be hard to know what’s important and what isn’t, and how to interpret the information and use it improve your future campaigns. To help you out, this guide will outline why reporting on your email campaigns is important, show you the metrics you should care about, and give you resources to improve your results. As a marketer, tracking every one of your efforts can often be difficult, and as a result it tends to fall down the priority list. Understand how you should be spending your time – Like all marketers, you’ve probably got a lot of different things to do and not enough time and resources to do them. Because of this, the key to your success is focusing on the initiatives that really drive results and not getting distracted by those that don’t. By measuring the ROI of your email marketing, you can see how it compares to other channels (like social) and better prioritize your time and efforts to drive maximum results. Prove the ROI of your efforts – With tightening budgets and an increased ability to measure everything, it’s becoming more important for marketers to be able to prove the ROI of their efforts to their bosses. By taking some time to view your reports and measure the success of your email marketing, you’ll have concrete evidence that shows the impact your efforts are having on the business. Improve your results – By regularly looking at your campaign reports, you can start to gain an understanding of what’s working and what isn’t when it comes to your email campaigns. You can see which subscribers are engaging with your campaigns, what content they like, and when they are most active, and you can use these insights to improve future campaigns and drive even better results for your business. Email marketing is one of the most trackable marketing channels on the planet, and tools like Splashmail provide you with literally hundreds of different data points about the success of your campaigns. So how do you know which ones are important and which ones you should be paying attention to? The good news is there is somewhat of a hierarchy of importance when it comes to email marketing metrics. Key metrics are the high-level data points that show the overall success of your email marketing campaigns. These include open rate, click-through rate and unsubscribe rate among others. These are the metrics you want to be tracking across all of your campaigns to monitor the performance of your overall email marketing efforts. 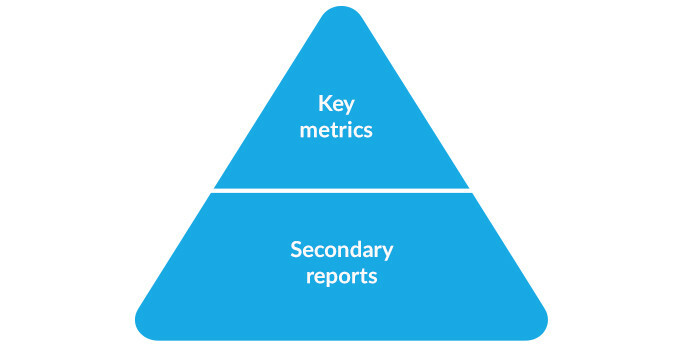 Secondary reports on the other hand, are the deeper level metrics that together influence the key metrics. 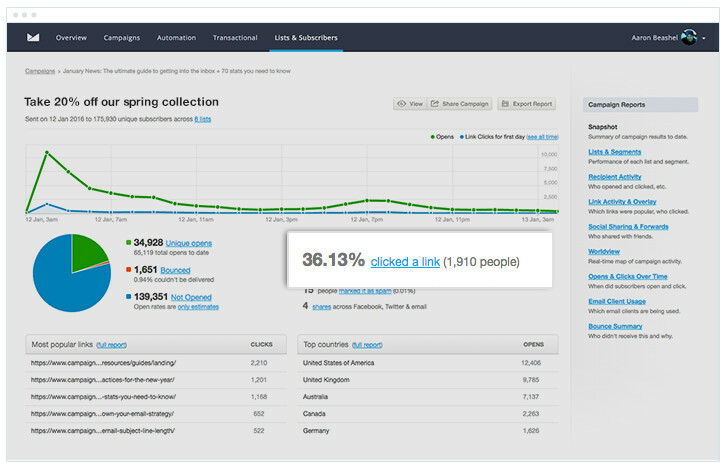 These include reports like opens per device, clicks per link, etc. These are the kind of reports you might not necessarily want to track every time, but can provide you with deeper insights you can use to iterate on your campaign design or strategy and improve your results. Open rate is a measure of how many people on your email list open your campaign. If you’re a Splashmail customer, you can find your email open rate in the Snapshot section of your Campaign Report. Open rates vary largely depending on the size of your list, method of collecting email addresses and a host of other factors, but generally speaking a healthy open rate is in the 20% – 40% range. If your open rates are above that then you’re campaigns are well optimized, and if they’re below that range then there’s likely some opportunity for improvement. Click-through rate is a measure of how many people clicked on one of the links in your email campaign. If you’re a Splashmail customer, you can find your email click-through rate in the Snapshot section of your Campaign Report. Your click-through rate can vary largely depending on the size of your list, the content of your email and a host of other factors, but generally speaking a healthy email click-through rate is in the 20% – 30% range. Email visits is a measure of how many people visited your website from your email marketing campaigns. If your goal with email is to drive people to your website, then it’s a useful metric for comparing how email performs against other channels, like search engines and social media, when it comes to driving visits to your site. 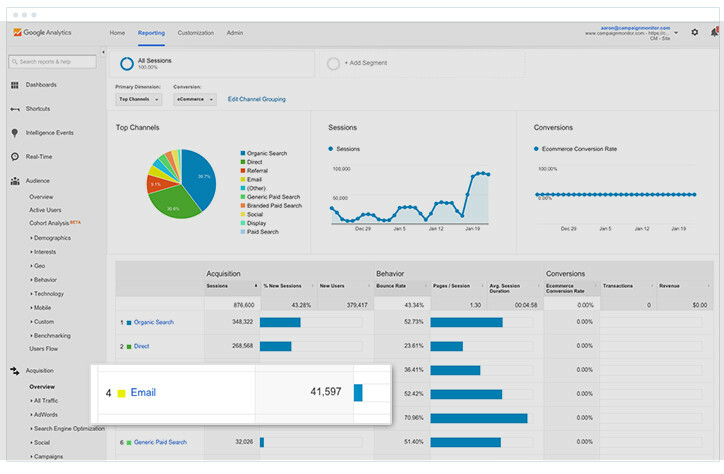 If you’re a Splashmail customer, our Google Analytics integration can ensure any visits from your emails are attributed back to the individual campaigns and can be seen in your analytics tool. To access these reports, you’ll need to sign in to your Google Analytics account and select the Overview tab from the Acquisition section of the sidebar. The first column in the table shows you the number of visits to your website from Email as well as other channels, and enables you to see just how successful your email campaigns are at driving traffic. Email conversions is a measure of the number of conversions (purchases on your eCommerce store, signups for your product, etc) driven by your email marketing campaigns. If, like most marketers, the main goal of your email marketing campaigns is to ultimately help drive sales & revenue for your business, then this metric will be very useful to you as it can give you quantifiable data on your overall return on investment. To access these reports, you need to login to your Google Analytics account and select the Overview tab from the Acquisition section of the sidebar. 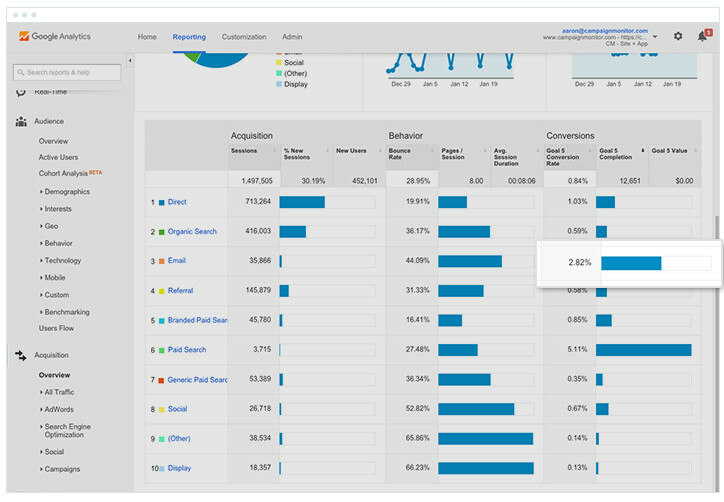 The right hand columns in the table show you the conversion rate, number of conversions and the associated revenue that has been driven from your email campaigns, and enables you to very clearly see the ROI of your campaigns against other channels. If you’re a Splashmail customer, enabling our Google Analytics integration will tag all visitors coming from your email campaigns and tie any purchases and revenue they generate back to the individual campaign they clicked through from, but you’ll also need to have conversion tracking setup in Google Analytics in order for these reports to show any conversion data. Unsubscribe rate is a measure of how many people unsubscribed from your email list from that particular campaign. If you’re a Splashmail customer, you can find your Unsubscribe Rate in the Snapshot section of your Campaign Report. According to our deliverability experts, if your unsubscribe rate is less than 2%, you are within industry norms. The one exception is when you send to lists you haven’t sent to in a while (I.e. brand new lists or very old lists), as they naturally tend to generate a higher unsubscribe rate than list you’re frequently engaging with. Bounce rate refers to the percentage of email addresses in your subscriber list that didn’t receive your message. There are a number of reasons this can happen, including that the email address no longer exists or because the recipient’s mailbox provider marked your campaign as spam. 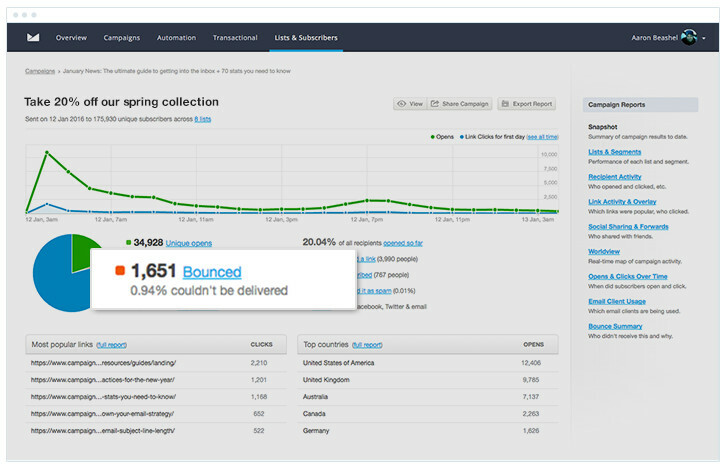 You can see the bounce rate for your campaign in the Snapshot section of your Campaign Report. According to our own deliverability experts, a bounce rate of less than 3% is healthy. If you’re seeing a bounce rate higher than that, it likely means you have some quality issues with your email list that you might need to fix up. The above mentioned key metrics are those that give you a high-level view of how well email marketing is working for your organization, but what happens when one of these metrics spikes or dips? The key metrics above can tell you what happened, but often you want to know why so that you can take action on it. That’s where secondary reports come in. These more detailed reports can help you get the insights you need to change your campaign design or strategy, and ultimately improve the key metrics above. If you send the same campaign to multiple lists (I.e. a discount offer to both your male and female customer lists), it can be useful to see how your campaign performed against each list and assess whether your various audiences are engaging differently. That’s where the Lists & Segments Reports comes in handy. This report, accessible by selecting ‘Lists and Segments’ from the right hand sidebar of your Campaign Report, shows you the key metrics like open rate, click-through rate & bounce rate across each of your lists. If one or more of your lists are under performing, it suggests an opportunity to either cease sending to that list (therefore increasing your open and click-through rates by no longer sending to unengaged people), or focus some efforts on improving the quality of the list. Our email list building guide is a good resource that can help with this, and shows you a 2-step process for capturing subscribers that will open and click on your campaigns. If you send multiple pieces of content in your newsletters, or include multiple links in your promotional campaigns, then understanding exactly what links users are clicking can help you improve the way you structure and design your campaigns. The Link Activity and Overlay Report can help with this. Overlayed on your original email, it shows you exactly where people clicked in your campaign and what content they engaged with. This report is useful for seeing how the layout and design of your campaign affects the way people engage with it. For example, you can see in the report above that the first content piece gets the most engagement, and that clicks tend to decrease the further down the email the content is placed. Insights like this can ultimately help you make more strategic choices about the layout and placement of content in your campaigns, and can help you make changes that positively impact your click-through rate and other key metrics. There are more devices and more email clients than ever before, and in order to ensure your campaigns look great wherever your audience is opening them, you need to know what devices and clients they are using. This is what the Email Client Usage report can help you with. 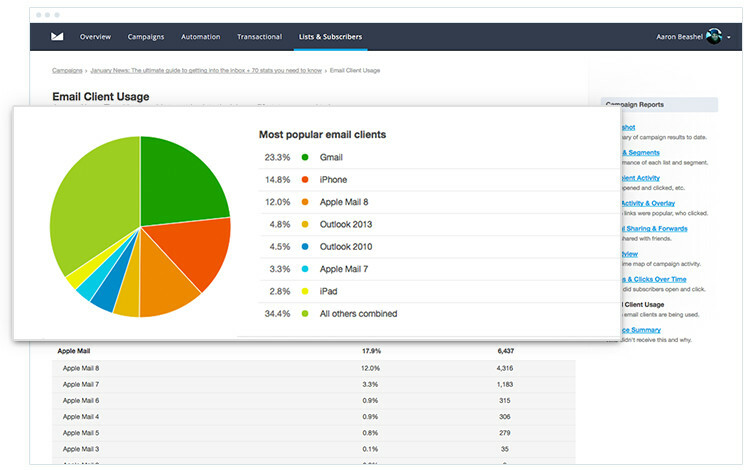 Accessed by clicking the ‘Email Client Usage’ link in the right sidebar of your Campaign Reports, it shows you a breakdown of the devices your subscribers are using to engage with your campaigns. Using the insights from this report, you are then able to optimize your campaigns to suit the environments they are being read in. For instance, if you see a lot of your subscribers are reading your campaigns on mobile devices then it might be worth optimizing your campaigns for mobile by applying some mobile email best practices. Depending on the size of your lists, you may have thousands of subscribers in all different timezones across the globe. These people are inherently going to be reading email at different times, and it’s important to understand those times and factor them into when you send your campaigns. This is where the Opens & Clicks Over Time Report can help. Accessible by selecting the ‘Opens & Clicks Over Time’ link from the right-hand sidebar of your Campaign Reports, the report helps you identify trends in when your campaigns are being opened and engaged with. With insights from this report, you can optimize the time you send your email campaigns. 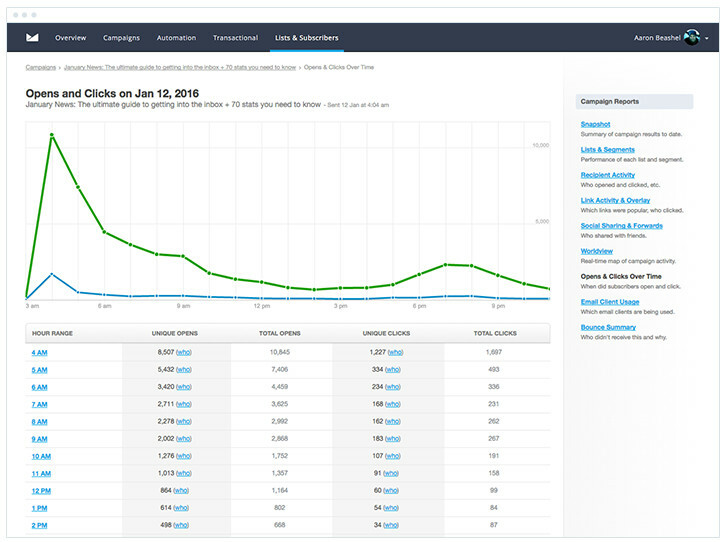 For instance, while there will always be a big spike when you first send your campaign, if you see that you get another spike several hours later as new time zones come online it be worth testing sending your next campaign at that time and measure whether it has a positive effect on your key metrics like open and click-through rates. Reporting on your email campaigns is an important but often forgotten part of email marketing. By taking the time to review your campaign reports, you can get a better understanding of how email performs for your business in relation to your other marketing initiatives and will be able to prove the ROI of your efforts to your bosses.